At the recent international agricultural trade fair ‘Salon International de l’ Agriculture’ in Paris, semi-governmental trade association VAL’HOR and MPS extended their partnership agreement. Moreover, this agreement now also covers Excellence Végétale, a foundation that promotes companies with sustainable production methods and works to coordinate and promote Plante Bleue and MPS certification. VAL’HOR is the scheme manager of France’s premier social and sustainability certification scheme, Plante Bleue. There are three levels of Plante Bleue certification: the highest level (level 3) is based on social requirements and monitored environmental registration (through MPS-ABC, for instance) of crop protection products, fertilisers, water management, energy use and waste management. Combining Plante Bleue with MPS-ABC registration lets growers reach the highest level of certification. In the previous agreement, the two parties had already agreed to offer combined audits. Yolande van den Boom (CEO MPS Group): “Together with the aforementioned parties, we are committed to continued sustainable development in the French Flowers & Ornamentals sector, lifting the sector to a higher plane. FSI is a network organisation of various parties and NGOs that are working together towards a more sustainable Flowers & Ornamentals sector. MPS is involved in this effort as part of its ambition to bring parties together in order to work on making sustainability efforts more transparent. FSI’s objective is to ensure that 90 percent of all products traded by its members are purchased and traded sustainably by 2020.
focusing on reducing the use of plant protection products throughout the chain, among other efforts. Other key objectives include improving transparency and communication throughout the chain. MPS-ABC registration and MPS-ProductProof are essential tools for the project, as they enable accurate registration and analysis, whilst encouraging the transition to more sustainable growing practices. The animation below explains how this all works out in practice. There was some uncertainty in the sector with regard to the timespan required to obtain MPS-GAP, with some companies believing it could take up to a year. MPS-GAP certification need not take that long. Continue reading for a more detailed explanation and 9 other reasons to combine MPS-ABC and MPS-GAP. MPS-ABC is the main environmental certificate for consciously sustainable growers. It is a registration tool that can be used to track crop protection products, energy, fertilisers, water and waste. MPS-ABC is a monitored system featuring independent checks, audits and sampling. MPS-ABC is entirely unique in the field of monitored environmental registration. The MPS-GAP certificate was introduced for companies supplying products to traders retailers, based on certain requirements in the areas of traceability, environment, safety and hygiene. MPS-GAP requires participants to register their use of crop protection products on a daily basis, as is made possible by the MPS-ABC registration tool. On top of that, MPS-ABC shows (or quantifies) the environmental effect of the measures taken for MPS-GAP. Growers who are just starting out with MPS-ABC do not have to register their usage for an entire year first, before they can obtain MPS-GAP, as MPS-GAP certification need not take that long. One of the requirements of MPS-GAP is that the companies have an MPS-ABC certificate (or equivalent), but MPS-D status (uncertified) will also be considered sufficient for a limited start-up period. As such, growers need not necessarily complete a full year of registration before they can get started on MPS-GAP. MPS-GAP meets all FSI2020 requirements and has been included in the “basket”. In the near future, Credible Record Keeping will also become an FSI requirement, which will hopefully encourage many other parties to follow suit. Credible Record Keeping through MPS-ABC is the basis for MPS-GAP. With MPS-GAP, participants can be sure that they are ready for the future. Many traders already recognise and use the MPS Trade Portal as a strategical purchasing tool for certified sustainable products from the flowers & ornamentals sector. All MPS-certified companies are shown on this platform, boosting their chances on the international and domestic market. MPS-GAP has the ambition to close the chain when it comes to sustainability. In addition to the fact that MPS-ABC acts as a foundation for MPS-GAP, growers are faced with more and more requirements with regard to starting materials and additional purchases. In many cases, starter materials and additional purchases must also be GAP-certified. MPS-GAP works with a step-by-step process that sees a company work towards using only certifiably sustainable materials in 3 years’ time. With this process, MPS helps growers become more sustainable at their own pace. Companies purchasing certified starter material also receive MPS-ABC bonus points. 6 MPS-GAP is benchmarked with GLOBALG.A.P. All companies certified with MPS-GAP feature on the MPS Trade Portal and in the GLOBALG.A.P. database. This is important, because retailers (e.g. in Germany) are tightening their sustainability requirements. Thanks to this benchmark, MPS-GAP-certified companies can also be found by German retailers. All MPS-certified companies can use the uniform MPS vignette, which features a unique number that is linked to Volgjebloemofplant.nl, a website that consumers can use to find out more about a product’s certificates and origins. On top of that, the platform gives growers the opportunity to showcase their companies and products. In addition to this MPS Vignette, MPS-GAP participants can also use the GGN label (the GLOBALG.A.P. consumer label), although this does require them to add GRASP to their certification package . Companies wishing to feature the GGN label on their products must enter into a license agreement with GLOBALG.A.P. and pay a license fee. 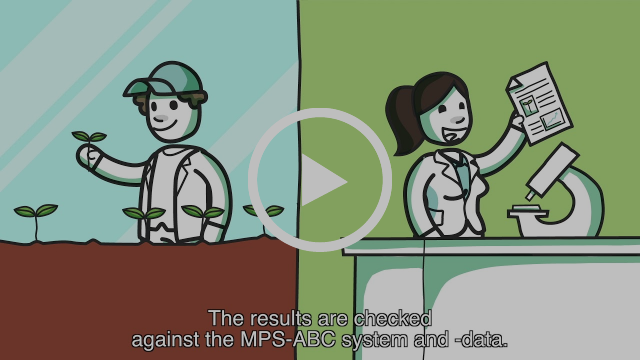 By participating in MPS-ABC, growers make their performance transparent and quantifiable. On top of that, the Credible Record System used by MPS is one of the most progressive of its kind all over the world. Companies can use MPS-GAP to showcase their Good Agricultural Practices, and combining MPS-ABC with MPS-GAP truly makes one plus one equal three. MPS-certified growers already operate in 40 countries all over the world, but GAP certification - an international standard - allows them to make the most of all international opportunities they encounter. Because MPS-ECAS can handle the entire certification process, including for MPS certificates, growers only need to go to one place. Various legal requirements, such as demonstrating mandatory employee instructions and legally required RI&Es have been included in MPS-GAP. Finally, both MPS-ABC and MPS-GAP are now ISO 17065-accredited product certification schemes, guaranteeing independence, worldwide recognition and certain reliability and quality. Last month, another three companies in North America started off with MPS-ABC registration. Charlotte Smit, our regional MPS coordinator, paid a visit to the companies to inform them about the latest sustainability developments and help them explore how they can use the outcome of their MPS-ABC registration to improve their sustainability performance and transparency. Kraemers Nursery, Means Nursery and Olive Hill Greenhouses got started with the innovative tools provided by MPS with great zeal. In North America, MPS works with the AmericanHort industry organisation. Are you all ready for the uniform MPS vignette? More and more partnerships are emerging in the chain to develop sustainable solutions together. MPS is a big supporter of this. After all, joining forces, sharing knowledge and promoting transparency are important values nowadays. In this MPS NewsFlash, we will focus on one of these partnerships: our joint project with Natuur & Milieu, LTO, WUR and CLM to develop an ‘Environmental Indicator for Crop Protection Products.’ We will describe this project in greater detail below. Natuur & Milieu believes we are an ‘important link between growers, the market and society’, which is something we’re very proud of. We will keep you informed of our progress in this project! Vierstra: “Our goal is to ensure that growing crops no longer harms the environment. However, growers can only implement measures that fit the economic reality in which their businesses operate.” Because of food safety, growers in the fruit and vegetable sector have been working on organic production for much longer. In the flowers & ornamentals sector, it took a little longer for this discussion to arise, because human health is less of an issue here. “Despite this, the average grower of flowers & ornamentals uses more crop protection products than a producer of fruit & vegetables, because of stricter aesthetic requirements. As such, it is a good thing that it has become a hot topic in the flowers & ornamentals sector too, as it means the market will start demanding improvement and be open to a discussion about costs”, says the programme leader. He also has three solutions to aid the transition from high-risk to low-risk products. “There are plenty of CPPs, but some require in-depth knowledge to be used effectively. On top of that, they can be more expensive than more common alternatives”, says Vierstra. Another solution is to breed more resistant varieties of crops, which can withstand diseases and pests. The parties purchasing these products also have a role to play, as it’s up to them to demand these crops. Vierstra’s third solution is better coordination of environmental requirements, because growers currently have to deal with different parties who all have different demands. “It would be best if we wouldn’t only start asking which specific products are used, but also inquire after the full environmental impact of all products used”, says Vierstra. That’s why Natuur & Milieu is an enthusiastic supporter of the ‘Environmental Indicator for Crop Protection Products’, a project that they initiated along with many other industry parties, such as MPS, LTO, WUR and CLM. The aim of this project is to develop an integrated indicator and a calculation system that describe the effects of crop protection products on the environment, biodiversity and health; that meets the wants & needs of the industry, market and society; that provides an easy, transparent way to calculate the impact of growing a particular crop; that can be applied internationally, and that is widely supported. Vierstra also highlights that the discussion surrounding sustainability is here to stay and that the role played by organisations such as MPS is only set to increase. "Sustainability starts with transparency in the chain. That’s one of MPS’s great strengths: they gather information and make it transparent, which makes them an important link between growers, the market and society. We’re very enthusiastic about their positive efforts”, Vierstra concludes. For some time, there has been uncertainty in the industry with regard to how long it takes to obtain MPS-GAP certification, with some parties even claiming that it can take a year. The lead time for obtaining MPS-GAP certification is much shorter than many people think. Growers who have just started the MPS-ABC process (or have yet to start) do not have to keep registrations for a year before they can obtain MPS-GAP certification. When growers start their MPS-ABC registrations, they will not be certified for the first 13 four-week periods. Nevertheless, they can still get started with MPS-GAP certification immediately, up to 17 periods (68 weeks) after the start of the initial registration. If you have any questions about MPS-GAP certification, please contact Raymond Scheepens at or on tel. +31 (0)6 538 625 51.
where possible, be implemented in the new registration tool. If you have any questions or would like to take part in the MPS Customer Panel, please contact Martine Holtkamp by sending an e-mail to or calling her on +31 (0) 6 834 833 67. MPS supports participants in MPS-ABC and, optionally, MPS-ProductProof in registering their consumption levels as efficiently and easily as possible. Registration (periodic registration) or Actres Top (daily registration) and have any questions about this, you can now also consult our instructional videos with useful tips & tricks. These instructional videos will soon also be available in English. You can find our instructional videos here. Of course, our Service & Support team is always ready to help: Contact MPS Service & Support at or on +31 (0)174 615 715. The uniform MPS vignette was introduced on 23 August 2017. This vignette replaced a multitude of MPS vignettes and logos that had been used in the flowers & ornamentals sector up to that time. Together with the interactive platform www.followyourflowerorplant.nl/en, the uniform MPS vignette contributes to uniform working methods and product labelling for products by MPS-certified companies, as well as offering transparency to consumers. You can continue to use the old vignettes until the end of this year. Starting from 1 January 2019, the old vignettes of the certificates in question may no longer be used on materials such as packaging, plant markers, etc. If you have any questions or would like more information, please contact Colin Maas at . If you have any questions or would like more information, please contact Remco Jansen at . If you have any questions or would like more information, please contact René Rombouts at . If you have any questions or would like more information, please contact Arthij van der Veer at . If you have any questions or would like more information, please contact Raymond Scheepens at or on tel. +31 (0) 174 615 715. The holidays are almost upon us. Traditionally, this is a time to look back at the past year, whilst also looking ahead to the future. For MPS, a review of 2018 leads to mixed feelings. The start of 2018 seems like yesterday, time has truly flown. On the other hand, it also seems ages ago, because so much has happened and so much has changed compared to last year. We have put a lot of time and effort into automating and digitising our organisation’s processes and products, resulting in a scalability that lets us properly handle the growth we’re experiencing. Automation alone, however, is not the answer. In order to keep pace with the developments in our sector (as well as the growing and changing demands of our customers), we need an effective, skilled team. This, too, saw major investments in 2018. Strengthening our foundations has started bearing fruit and we have carefully prepared our plans for 2019. MPS is growing. The demand for more sustainable products in our horticultural sector is growing. The number of partnerships between MPS and other parties in the sector is increasing. Ideas for new and improved products and services are being developed, often in collaboration with others. More and more shared initiatives are cropping up, as parties link up and join forces. MPS believes in this development and is committed to being part of it. 2019 promises to be yet another busy, exciting year, in which the sector will become increasingly more sustainable. We’re immodest enough to admit that we’re proud of what our team managed to achieve in 2018. We’re twice as proud, however, of all MPS users, who are making their businesses more and more sustainable at increasingly greater speeds. On behalf of all MPS colleagues, I would like to wish you and yours a merry Christmas and a healthy, successful 2019! MPS’s position and activities in North America have been expanded gradually since 2008. Sustainability is becoming an increasingly important topic and consumers are becoming more and more critical about issues such as the use of plant protection products and packaging materials. Remco Jansen (Commercial Manager at MPS) and Arthij van der Veer (North America coordinator at MPS) visited North America last week to inform retailers and growers there about developments in the field of sustainability. Their first appointment was with AmericanHort, the largest growers’ organization in North America. During the visit, Remco & Arthij spoke to Ken Fisher (AmericanHort CEO), who, together with MPS, visited the Netherlands in February 2018 to see the Dutch best practices with regard to sustainability in the flowers & ornamentals sector with his own eyes. AmericanHort believes that MPS-ABC is the instrument that will let North America’s green sector get ready for the future. More than 30% of North America’s Top-100 growers take part in MPS-ABC, and this share is growing slowly but surely. In the first quarter of 2019, AmericanHort and MPS are set to publish a series of articles in Industry-Insider (an American trade journal). This six-part series, which will address all MPS-ABC themes, will serve to inform growers. MPS also visited FSI members (Floriculture Sustainability Initiative), Floricultura (Salinas, CA) and Syngenta Flowers last week, as well as Seville Farms and J.Berry Nursery, in Texas. American retailers are also setting more and more demands with regard to the use of plant protection products, including Ahold/Delhaize in Salisbury, NC. Here, MPS gave a presentation to the Sustainability & Wellness department, who are currently developing sustainability requirements for all brands under the Ahold/Delhaize umbrella. Ahold/Delhaize is also an FSI member and is focused on implementing sustainability. If you have any questions or would like more information, please contact Remco Jansen at or on tel. +31 (0) 174 615 715. The production and sales of flowers and plants are growing considerably in Turkey, with more and more growers exporting part of their flowers & ornamentals products to Europe. Countries such as the Netherlands, the United Kingdom and Germany are key destinations for Turkish producers, with exports to these countries rising sharply over the past few years. Turkish flower and plant exports to the Netherlands jumped by no less than 32% in the first ten months of 2018, compared to an increase of 8% to Germany and the United Kingdom. In view of the sustainability and certification developments in European retail, these themes are becoming increasingly important in the Turkish sector as well. As a result, there is a growing interest in sustainable production methods and validated sustainability assurance in Turkey, which means that the demand for MPS certification in Turkey is growing steadily. In recent years, the number of MPS participants from Turkey has been on the rise: the sole MPS participant in Turkey four years ago has now been joined by 17 others. “In November, MPS-ECAS carried out its annual audits again. The growers I spoke to were all very happy with our auditors. Although a few areas for improvement were identified, the growers agree that this is justified. They are now hard at work to make up for their shortcomings.”, says Raymond Scheepens, commercial manager at MPS. In August, MPS appointed coordinators in Turkey. In consultation with the coordinators, a number of meetings were scheduled for the second week of December, which saw our commercial manager travel to Turkey to inform, encourage, and motivate growers with regard to certification, as well as informing them about developments in Western Europe. Together with the Turkish trade association of flower & ornamental growers, called Süsbir, and other parties, three meetings were scheduled in a single week. The first was in Antalya, a familiar city to MPS, as it is home to 14 MPS participants. A day later, we went to a meeting in Yalova, a new region for MPS, before ending in Sakarya, where a major tree grower has since joined MPS. The commercial manager looks back at successful meetings with good presentations. “The growers listened carefully and asked the MPS team many interesting questions during the Q&A session. Many growers left carrying a Turkish MPS folder, armed with more knowledge about sustainability and certification. Potted plant grower FlorXL is based in Berkel en Rodenrijs and specialises in exclusive anthurium and agapanthus species. This 5-acre company is environmentally conscious, consumes little energy and has made its production methods as organic as possible, using natural enemies and organic protection products. It has had a closed-loop water system for five years now. “At that time, deciding not to discharge any water was rather progressive”, Sjef van Wijk remembers. They are currently looking into ways to make their packaging, including plant covers and trays, more sustainable. or apply for MPS-GAP certification. After MPS-GAP delivery certification, the next step will be to be obtain MPS-SQ certification, which can be used to show good working conditions. FlorXL already has its MPS-A qualification and is currently working on MPS-GAP and MPS-SQ. Van Wijk: “Everything in the company is ready for MPS-GAP. All we have to do now is wait for the audit, which has been scheduled for February. We want to be audited for MPS-SQ on the same time, which is something were still working on. When this is all said and done, FlorXL also wants to obtain MPS-ProductProof, which can be used to show on a product-by-product basis that certain active substances are not present and were not used during the growing process. You can continue to use the old vignettes until the end of this year. Starting from 1 January 2019, the old vignettes of the certificates in question may no longer be used on materials such as packaging, plant markers, etc. Click here for information. Would you be interested in a presentation about what MPS is doing to improve the sustainability of the horticulture sector? If so, then contact Eveline van Hooren by e-mail at: . Companies wishing to include the GGN label (GLOBALG.A.P. consumer label) on their products must sign a licensing agreement with GLOBALG.A.P. and pay a licensing fee. In practice this will usually be done by the trader. For more information about using the GGN label, please send an e-mail to . If you have any questions or require further information, please contact our Service & Support team at or on +31 (0)174 615 715. Of course, our Service & Support team is always ready to help. You can contact them at or by calling +31 (0) 174 615 715. For more information, please contact Marie-Françoise Petitjean (in English or French) (Coordination MPS France). She can be reached by calling +33 (0)9 63 53 60 21 or by e-mail at .